Hi there… Have you missed me? I was hoping that someone would call for a search party! I’ve been buried under a pile of boxes and whatnots! I have never felt more like a hoarder. I remembered packing up my sewing room last year – 6 boxes or so, right?? Try 35! 35 boxes of fabric, patterns, notions, organizers, tools… that doesn’t include my 5 sewing machines, dress form, and shelving. So, as it may be a while before I’m up and sewing, I’m enjoying rediscovering some of my past projects. The ones that came before the blog. 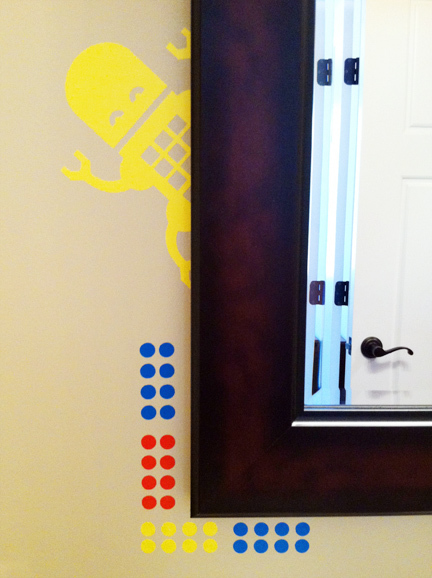 Before the move, I designed my son’s bathroom in “preppy” robots – a great theme that he won’t outgrow anytime soon. And when he does, I will only have to swap out the accessories because the color story should last through his teenage years. I made a fun plaid shower curtain to anchor my design and built from there. 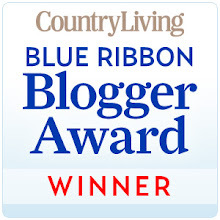 I’ll have to share the curtain with you in a future post. 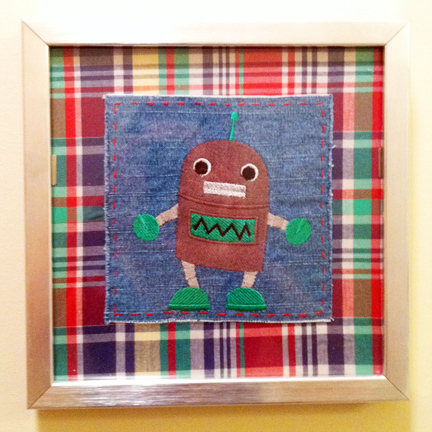 I used scrap fabric (denim and leftover plaid from the curtain), simple $10 frames from IKEA, and my embroidery machine to create some original artwork. 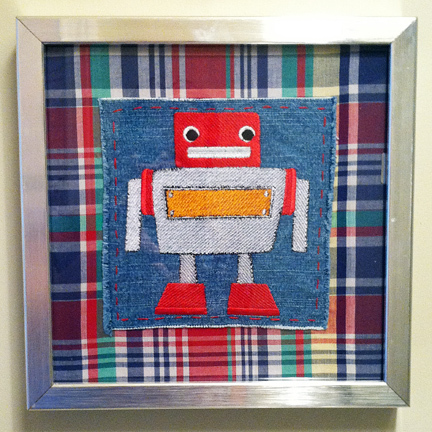 I first embroidered my robots onto the denim and ironed Wonder Under between my denim and plaid layers to hold the pieces in place. I then did a quick hand-stitch around the border of the denim, just for decoration. 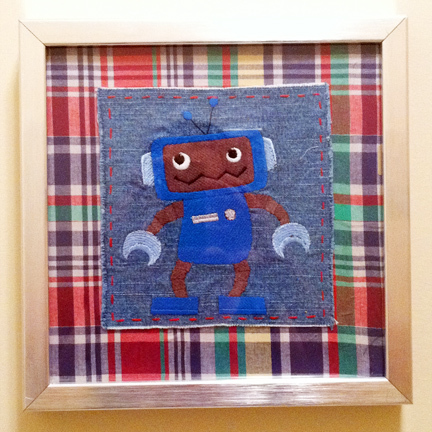 I trimmed the plaid fabric to the dimensions of the frame insert - the hard backside of the frame. I used Mod Podge (my “go to” for everything!) 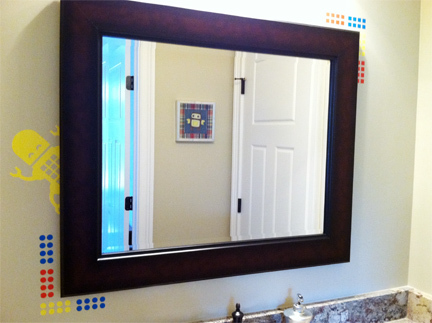 to adhere the fabric to the frame insert and added my hardware to hang. So simple! The most time consuming part of this project was the embroidery. It took around 30 minutes for each robot. I ran into machine trouble, too, which slowed down the process. 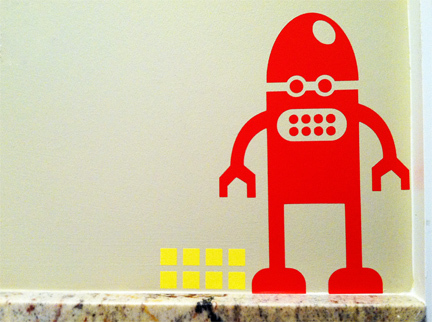 So, for his new bathroom, all that I’ve added is these great wall decals that I found at Michael’s on clearance. They were completely perfect in theme and color. A fun addition, don’t you think? So, as I’m thinning out my supplies, I’d like to share some of them with you! Who’s up for a free pattern? Dealer’s choice, but never used… I’ll pick a winner at random this coming Friday. Just leave your comments below! Thank you for coming back to see me after such a long time! 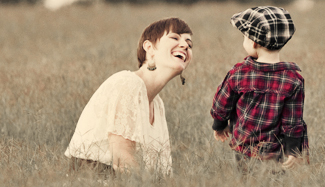 I look forward to fun and creative times to share with you as my life settles back into a routine.